Salinity results from an imbalance in the water cycle, caused by changes in landscape vegetation. Deep rooted perennial grasses, legumes, shrubs and trees use most of the rain that falls on the landscape, while shallow rooted annuals use less water. Some of this unused rain drains through the soil profile adding extra water to groundwater storage in a process known as recharge. As the groundwater storage is filled the watertable rises, salt in the soil is dissolved and moves upward with the water table. If the watertable rises to within one to two metres of the soil surface, water and dissolved salts are drawn up by evaporation. Areas where salt appears on the surface are known as saline discharge sites. There are at least 29,400 hectares of land affected by saline discharge in North East Victoria (combined North East and Goulburn Broken regions) (Victorian Resources Online). On the Southern Slopes of NSW, the area east of Wagga Wagga in the Murrumbidgee Catchment is the greatest concern with 18,222 ha affected and an additional 379 ha in the Murray Catchment (NSW Murray Darling Salinity Audit, 2009). In South West Victoria (Upper and Lower portions combined), the affected area is 51,000 ha (see South West Victoria Package). Discharge results in loss of pasture production (especially in salt sensitive pasture species, such as clover and lucerne) in affected areas. This poor plant growth results in bare ground being exposed to wind and water erosion and the invasion of salt tolerant weeds such as sea barley grass. Nutrient imbalances or deficiencies in affected soil further reduce plant growth. High salt levels lead to soil structure decline and a range of environmental problems, such as mobilisation of salt into waterways. This is transported to downstream catchments and communities and also has adverse effects on aquatic life. 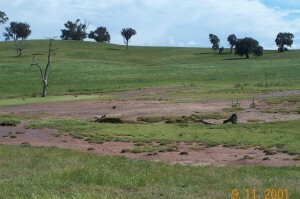 Pasture decline and soil erosion are typical of saline discharge sites in North East Victoria. The key to developing effective dry land salinity management strategies lies with understanding how landscapes and groundwater processes function to cause salinity. Over the past few decades there has been a focus on the control of groundwater recharge, as this was thought to be the primary cause of salinity. This approach has advocated the broad-scale replacement of low productivity pastures dominated by annual species with pastures based on perennial grasses and legumes as a means of reducing groundwater recharge and controlling dry land salinity. Therefore land management has focused largely on attempts to reverse changes in the hydrological balance following agricultural development. Much effort towards understanding the relationships between soils, rainfall, vegetation and farming systems has aimed to identify productive land management practices that use more rainfall, whilst limiting runoff and groundwater recharge. Salinity management requires an integrated approach to landscape water control. Each catchment is unique so it is not possible to simply translate our understanding of one particular landscape to others. The manifestation of salinity in each region is closely linked to the groundwater processes prevailing within that region (such as size of the aquifers, how readily they transport groundwater, and their storage capacity), and relationships with regional landscapes. Other factors contributing to salinity include the area of the catchment cleared and the type of pastures and crops. Only when these relationships are understood can informed salinity management planning occur. Pastures for sheep and cattle in the region have traditionally been based on either annual grass and clover species or perennial grass species such as perennial ryegrass or phalaris with annual subterranean clover. Almost all their growth occurs from the autumn break in mid-April until pastures dry off in mid-December, and they respond only to large rainfall events during summer. Furthermore, they have little capacity to extract water below a depth of 1.4 m.
Pasture plants that can be grown in the region and with greater summer growth than perennial ryegrass or phalaris include summer active tall fescue, lucerne, and chicory. These species remain green through the summer period and can extract water to a greater depth. Higher water use during summer and deeper rooting characteristics suggest they reduce leakage below the root zone. For example, lucerne roots can grow to three metres deep which is a greater depth than all annual and most other perennial species. At the Wagga Wagga Proof Site, where lucerne was planted on the slopes, the soil profile at the bottom of the slope was 200-300 mm drier than an annual pasture (400-600mm compared to 600-800mm). In the Triple System at Hamilton EverGraze Proof Site, lucerne reduced recharge by 80 mm/yr compared to ryegrass pastures on well drained crests, and summer active tall fescue on clay flats reduced recharge by up to 60 mm/year compared to ryegrass pastures. Although chicory also demonstrated an ability to reduce recharge at Hamilton, it only persisted for three years. Similarly, chicory didn’t persist past its second year in dry conditions at Wagga Wagga. Lucerne is the only plant that fulfils the three criteria for fully controlling recharge (Table 1). Results from the Wagga Wagga EverGraze Proof Site also indicate that including lucerne in the system can significantly increase production and profit. Information on the suitability of different pastures for place and purpose in the region can be found under Pastures in the Regional Package. A quick reference guide is also provided.. Although lucerne appears to be the most effective pasture species for managing recharge, it is suited only to areas that are well-drained and with low soil acidity and aluminium. Conversely, tall fescue is tolerant of waterlogged areas but is only suited to the valley floors in the cooler areas of the region (higher altitude) with >650 mm annual rainfall. Selecting the right combination of plants must also consider the needs of the livestock production system, and individual management requirements of each plant species and variety. The EverGraze Exchange – Selecting pastures for place and purpose provides the considerations and process for making these decisions. The management of summer active perennials will also influence the degree to which they are able to control recharge. For example, rotational grazing of lucerne is required to enable it to persist at sufficient densities to extract the stored winter surplus during the following summer. A second limitation of summer-active pastures is that both surface runoff and groundwater recharge decrease. In many areas the livestock enterprise relies on surface runoff to fill farm dams used for stock water. In many areas of the region, ground water is an important source of stock water, and some recharge is necessary to maintain the resource. Therefore, while there is a need to reduce recharge from the overall landscape, surface runoff and groundwater recharge should continue in some parts of the landscape to fulfil stock water and environmental requirements as well as community expectations of stream flow. An EverGraze catchment modelling study conducted for the Tarcutta area predicts impact on recharge and stream flows from adoption of lucerne and trees. 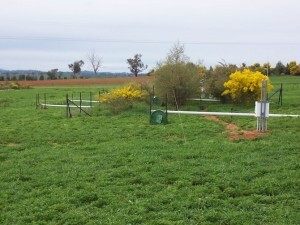 A related study predicting the impact on farm dams from adoption of the Hamilton systems in the Wannon Catchment is provided here. 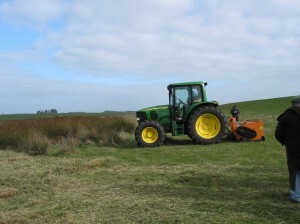 Although these species may not fully control recharge, well-managed deep rooted winter active perennials such as phalaris, cocksfoot, winter active tall fescue and perennial ryegrass will stay productive later into the growing season, resulting in a higher water use than annual-dominant pastures. Late flowering perennial ryegrass on the valley floors of the EverGraze Proof Site at Hamilton used more water than the failed kikuyu pasture which was dominated by silver grass and sub clover. 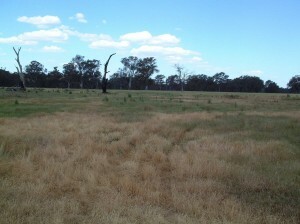 At the Broadford Grazing Experiment in central Victoria (mean annual rainfall 625mm) a dense stand of phalaris/sub clover which was rotationally grazed to achieve persistence of the perennial, also used significantly more water than a set stocked pasture dominated by capeweed and sub clover. 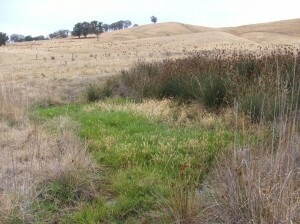 It is likely that the higher water use in this scenario was a result of the higher perennial density, rather than the rotational grazing, as other studies have not shown a difference in water use resulting from management of perennial pastures of similar composition (Greener pastures for South West Victoria, Page 59). There is also variation within winter active perennials. In a comparison between phalaris and perennial ryegrass, Miller (1991) showed that there was little difference between the two species in the water use to 60 cm, but a significant difference from 60 cm – 130 cm, phalaris used significantly more water. Productive native perennial grasses such as Microlaena, wallaby grass and red grass will also increase water use compared to annual species, especially late in the season after annual species have died off, although this has not been measured. As discussed in the previous section the cause – understanding catchment processes, in local flow systems groundwater flows less than 5km. Excess water mobilises and accumulates salt in the lower parts of the landscape. Reducing the movement of water down slope is one way to mitigate this form of salinity. One option to achieve this is to establish tree and shrub belts along the contour to create dry soil buffers that are capable of absorbing water flowing down slope as either surface flow or sub surface flow across the soil A/B horizon interface. The shrubs used more water than annual pastures and therefore created a small dry soil buffer in the area where they were planted. However, the area sown to shrubs was not large enough to significantly reduce soil moisture at the foot of the slope, ie recharge control. Lucerne and the shrubs used similar quantities of water, and because lucerne was sown throughout the paddock, it had a significant effect on soil water at the foot of the slope. That is, lucerne pasture without shrubs would provide recharge control similar to lucerne with shrub belts. 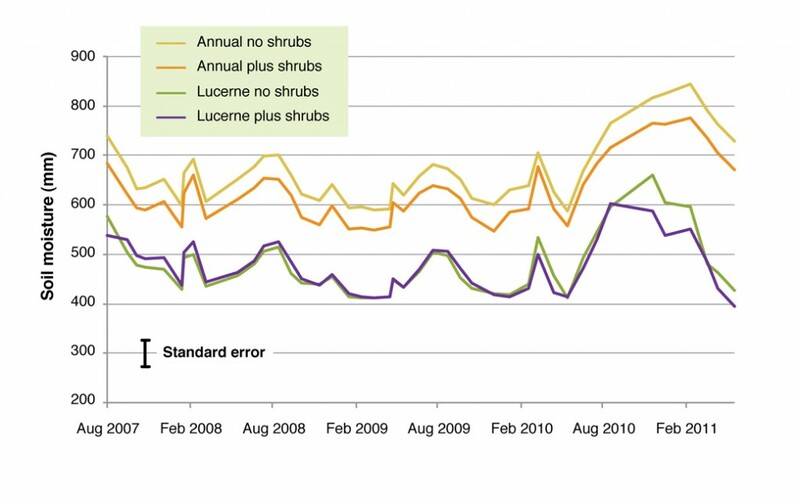 Shrubs had no impact on pasture growth. So soil moisture in the pasture areas between the shrub belts was largely unaffected and therefore had no impact on pasture growth, but no additional recharge control either. The evidence from the Proof Site does not support the use of shrub belts for recharge control in environments such as those at Wagga. However, it does not mean that farmers should not plant shrubs for other reasons such as discharge management, livestock shade and shelter and biodiversity. An integrated approach to planting trees, shrubs and pastures is the recommended method for effective recharge control. This combination of trees, shrubs and pastures and where they are positioned in the landscape has been outlined based on groundwater flow systems. If planting trees and shrubs is being considered for recharge control, developing a whole farm plan and identifying groundwater flow systems is vital. 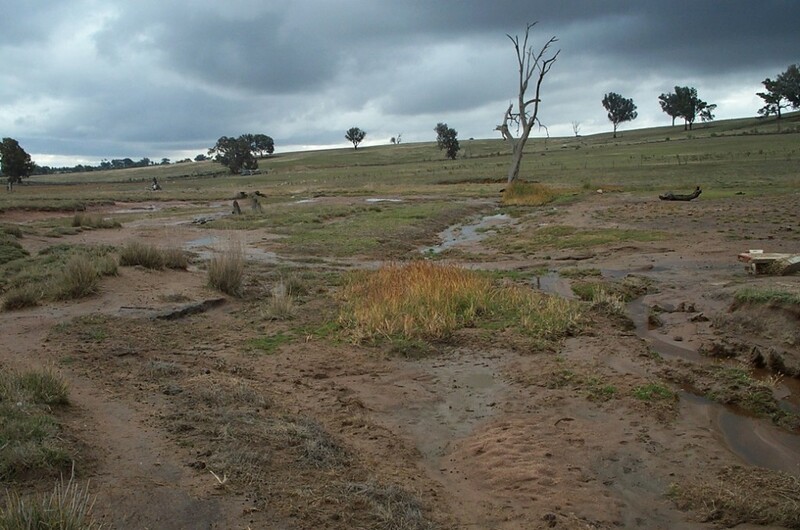 Shrubs planted at the break of slope at Wagga Wagga were effective for creating a dry buffer zone around the plants but did not reduce accumulation of water at the base of the slope in comparison to annual pastures. In addition to information provided below, Saltland Genie uses the latest knowledge and tools for salt-land management from the Sustainable Grazing on Saline Land initiative to compare the pros and cons of 11 possible options to manage saline land for a unique farm scenario. The tool also provides case study examples of what has worked for landholders. A saline soil is one with an accumulation of free salts at the soil surface and/or within the profile affecting plant growth and/or land use. These areas typically have carrying capacities of less than 5 DSE/ha, and are dominated by undesirable plants such as sea barley grass and spiny rush. Yet with appropriate management, carrying capacities on some saline areas can be increased 2-4 fold. Furthermore, stock can gain weight during summer, because high water tables allow pastures in saline areas to remain green while other pastures are dry. Plants may face several challenges in saline soils: salinity (salt in the soil water), waterlogging (lack of oxygen for root function) and/or periodic flooding (water above the soil surface). A combination of these challenges is particularly difficult. For example, plants that actively exclude salt from the root surface in well-aerated soils cannot do this when the soil is waterlogged, because the roots don’t have sufficient oxygen. Many saline areas are small (<5 hectares), and it may not be worthwhile to manage them for production. Electrical Conductivity (EC): Salinity is measured by the ability of water to conduct an electric current. Increasing salt in water or soil increases conductance. Distilled water has an EC of less than 0.0001 deciSiemens per meter (dS/m), and seawater is 55 dS/m. EC 1:5 is reported as part of standard soil analyses. It is the most routine measurement of salt content, but is affected by any particles in the water suspension including dispersed clay and organic matter. ECe is the electrical conductivity of water within the soil when the soil is saturated with water, and is thus a more direct measure of soil salinity. However it is a more difficult procedure because it takes in to account soil texture and is not carried out routinely. Approximate conversions between EC 1:5 and ECe are shown in Table 2. EM: Electromagnetic signals provide an indication of where salt is presently or is likely to develop into a problem. It is a useful technique to determine soil salinity classes and the appropriate location of fencing for saline areas. An EM38 held horizontally detects salts in the top 40 cm, and if held vertically 1 m. An EM31 in horizontal mode senses the top 2 m, and vertically the top 6 m.
Values of EC 1:5 and ECe change about 3-fold during the year. Salt concentrations in the topsoil are highest at the end of summer because evaporation concentrates salts toward the soil surface. In contrast soil salinity drops during winter as rainfall flushes the salts deeper, thus winter-growing plants avoid the highest levels of salinity. Therefore the best time to measure soil salinity is between November and March, because its concentration is relatively stable, and indicates the highest levels of exposure to plants. Soil salinity can be determined precisely by soil tests or subjectively through observation of salt-tolerant plant indicator species. Field observations are a quicker and cheaper way of assessing salinity than soil testing or electromagnetic (EM) surveys. The presence of salt tolerant indicator species allows classification into a 3-class system, which is the first step in deciding management options. Class 2 – Where there is moderate salting, patches of bare ground appear, salt-sensitive species disappear and more salt-tolerant species become dominant. Soil test salinity range of (ECe) 10–25 dS/m. Class 3 – in cases of severe salting, only the most salt tolerant species remain. Large areas of bare ground will be apparent, often with salt stain visible during dry periods. Loss of topsoil from the site is common. Soil test salinity range of (ECe) 25–40 dS/m. 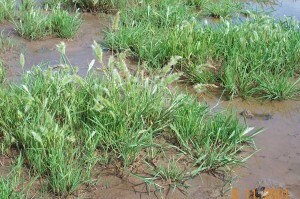 Sea barley grass (Hordeum marinum) is an introduced annual grass tolerant of Class 1 and Class 2 salinity, but it also grows widely in non-saline areas. It is eaten by sheep when in the vegetative phase. 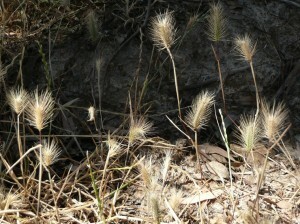 Annual beard grass (Polypogon monspeliensis) is an introduced annual grass tolerant of Class 1 and Class 2. Yellow buttons (Cotula coronopifolia) is an introduced annual plants tolerant of Class 2 and Class 3 salinity, flooding and waterlogging. They colonise disturbed areas and are readily eaten by sheep when in the vegetative phase. More information is available on salt tolerant plants. Fencing of saline land is the first step to improving its management because sheep and cattle tend to overgraze saline land. The next step is to either appropriately manage the native and volunteer species, or sow a new pasture. The saline areas should be fenced and grazed as part of the overall farm grazing system. Deferment of grazing in early summer can be used with native species that flower at that time of the year. Tall wheatgrass (Thinopyrum ponticum) is a productive perennial grass tolerant of Class 1 and Class 2 salinity. 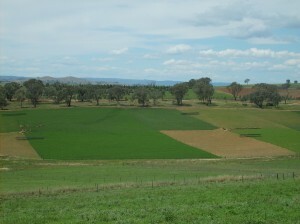 It has been the dominant pasture species sown on saline land in the North East and Goulburn Broken regions of Victoria. The variety Dundas, was selected for improved leafiness and digestibility in comparison to an earlier released variety called Tyrell. Tall wheatgrass will actively grow during the summer months if sufficient soil moisture is available. Saltland Genie case studies show that tall wheatgrass pastures sown in western Victoria have significantly increased carrying capacity of saline land, and providing green feed through summer, have also reduced supplementary feeding costs. Tall wheatgrass weed risk and managementTall wheatgrass is highly suitable as a hedgerow grass species or for planting in salt-affected areas. However a weed risk assessment undertaken by the Future Farm Industries CRC has identified tall wheatgrass as having a high environmental weed risk for Victoria through its capacity to invade and impact on wetlands. For this reason, the CRC does not recommend the planting of Tall wheatgrass in Victoria. Agriculture Victoria considers that because tall wheatgrass is already widely distributed and has production and animal welfare benefits, its continued planting is appropriate, provided that the following practices are adopted to reduce the risk to native vegetation. To minimise the risk of tall wheatgrass spreading into areas where it is unwanted, hedgerows should be grazed in January and February to remove immature seed. Areas surrounding Tall wheatgrass should be sown to competitive species such as perennial ryegrass or phalaris to reduce the chance of spread outside the sown area. Hedge areas should be located well away from waterways or natural wetlands, not only to reduce the chance of spread, but because these areas are often too wet for lambing and can harbour foxes. 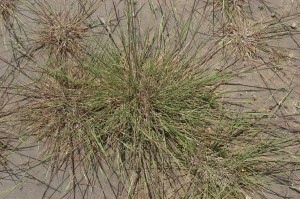 Puccinellia (Puccinellia ciliata) is a fine-stemmed perennial grass tolerant of Class 1 and Class 2 salinity, and more tolerant of flooding than tall wheatgrass. It is easily established and grows mainly during winter and spring, but will stay green during summer if there is subsoil moisture. 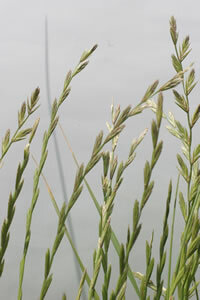 Tall fescue (Festuca arundinacea) is a productive perennial grass tolerant of Class 1 salinity. Saline areas should be sown to varieties that are summer-active. Balansa clover (Trifolium michelianum) is an annual clover tolerant of Class 1 salinity. It has good tolerance to flooding because its stems are hollow, allowing oxygen to move down to the roots when the plant is partially submerged. The most popular variety, Bolta, flowers in mid-November. Persian clover (Trifolium resupinatum) is an annual clover tolerant of Class 1 salinity similar to Balansa clover, but is more tolerant of flooding. Cultivar Nitro flowers about 2 weeks later than the Bolta variety of Balansa clover. Strawberry clover (Trifolium fragiferum) is a perennial legume tolerant of Class 1 salinity and waterlogging, but prefers alkaline soil, significantly restricting the area it can be sown in this region. It is a weak seedling, but with sufficient moisture stays green through the summer. Lucerne, although not known for its salinity tolerance, has been shown to tolerate Class 1 salinity. An excellent Saltland Genie case study from a farm near Wagga Wagga explains how lucerne sown with tall wheatgrass, puccinellia and strawberry clover was able to reclaim a waterlogged area with salinity ranging from 1-15 dS/m. 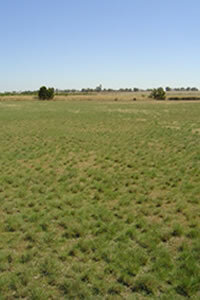 The first step in sowing a pasture on salt-affected land is to control annual grasses such as sea barley grass and other saline indicator plants like spiny rush. Late spring is the best time to determine the severity of salting by observing indicator plant species. Two soil samples (0–10 cm) should be collected, one from a less saline areas of the paddock and the other from more saline areas. These should be analysed for EC, pH, Olsen phosphorus and available potassium. Saline sites are usually variable in their salinity status so a mixture of pasture species should be sown. Suggested sowing rates are shown in Table 2. The pasture mix should be sown in late March or April after opening rains but prior to the site becoming to the site becoming too wet. This timing can be difficult to achieve. If cultivation is required prior to sowing, the length of fallow should be minimised to reduce salts rising to the surface, and the number of passes minimised to reduce damage to soil structure. Spraying for red-legged earth mite is necessary to ensure successful legume establishment. 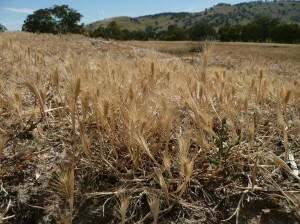 If there have been no sowing rains by late April, the pasture can be sown dry. However, dry-sown pastures have a higher proportion of unsown “weeds” than where cultivated or treated with herbicide between the autumn break and sowing. Alternatively, sowing may be delayed until spring depending on the species being sown and the prevailing site conditions. Class 1: Weed control is critical for these areas, and cultivation or a second spraying may be required between opening rains and sowing. Balansa and Persian clover will be strong competitors to the sown grasses and should be sown at a low sowing rate. Alternatively, these legumes can be drilled in or spread with fertiliser in the following year, once the sown grasses have established. Class 2: Plant germination is slower in Class 2 than Class 1. There are fewer weeds that compete with the pasture, and these emerge slowly. Legume growth is poor, so tall wheatgrass is more dependent on applied nitrogen to maintain vigour. Class 3: These may be primary saline sites (i.e. saline prior to European settlement), and inappropriate to sow with introduced pastures. Cultivation should be avoided. 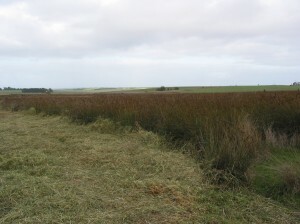 Separate fencing followed by deferment of grazing from December to mid-January will encourage the existing summer-growing species such as salt couch. Pastures established on saline sites require adequate nutrition, either from the soil or from fertiliser, to achieve satisfactory production rates. Appropriate care is essential when applying fertilizer in wetter areas of the landscape to avoid pollution of waterways. Phosphorus: Productive tall wheatgrass-based pasture requires soil phosphorus levels of 12–15 mg P/ha (Olsen P). If levels are lower than this, a phosphorus (P) fertiliser application will be necessary. Potassium: During wet years, potassium (K) leaches out of saline soils. Fertiliser applications of 10-20 kg K/ha may be required after years of high water movement. Regular soil testing will enable objective assessment of potassium levels, as well as other soil nutrients. Nitrogen: Tall wheatgrass often responds well to applied nitrogen (N), particularly on Class 2 land where legume growth is poor. Nitrogen levels can be raised with applications of 100 kg/ha of MAP or DAP in the year of sowing. Moderate to high levels of salinity restrict subsequent legume growth, and good responses can be expected from 50 kg N/ha as urea in late autumn or early spring. Sulphur: Discharge areas are nearly always high in available sulphur (S). High-analysis fertiliser such as MAP, DAP and TSP (which are low in sulphur content) can be used in saline areas. During the first growing season of the sown pasture the priority should be to ensure effective root development for anchoring of the plants prior to grazing. 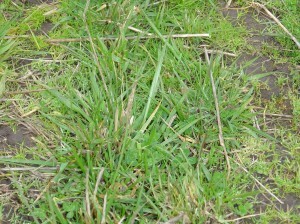 When this is achieved the pasture should be grazed once it reaches a height of 15 cm, and stock removed when it is 3 cm. Rotational grazing small paddock sizes, and large mob sizes are management practices that will ensure the pasture is maintained in a vegetative state which will maximise water use and its productivity. Small areas should be fenced and managed separately to avoid under or overgrazing. 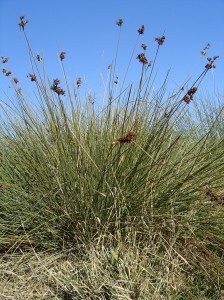 Spiny rush is an introduced weed that grows on Class 1 and Class 2 saline land, and is not readily eaten by livestock. It can dominate saline and waterlogged areas, reducing carrying capacity. Landowners are required to take reasonable steps to control it and prevent its spread. Control can be achieved using mechanical methods or herbicides. Control programs need to last 2 years to reduce the soil seed reserves, followed by planting of a vigorous salt-tolerant pasture to act as a strong competitor to any remaining seedlings. Drainage of surface runoff reduces the stresses of flooding and waterlogging on plants, while also improving animal welfare by creating drier areas for livestock to stand and camp. Interceptor drains divert surface water coming from higher up the slope. Raised beds allow plants such as Tall wheatgrass, which has less tolerance to flooding and waterlogging, to successfully establish while the drains favour Puccinellia. Raised beds also allow greater flushing of salts from the topsoil. The beds limit vehicle access, but allow livestock to avoid flooding during winter. Note: Drainage should not be contemplated on Class 3 salinity sites unless the surface is already bare, because of difficulties in restoring vegetative cover after earthworks. Farmer case study, Production and potential – taking advantage of dry seasons to repair waterlogged and saline areas, David McLure, Tarcutta. Sustainable Grazing on Saline Land – Turning saline land into a profitable asset.